HP Umpire Phil Cuzzi ejected Indians CF Michael Bourn for arguing a strike three call in the top of the 4th and Cubs C Miguel Montero for arguing balls and strikes in the top of the 8th inning of the Indians-Cubs game. In the 4th, with one out and none on, Bourn took a 2-2 slider from Cubs pitcher Jake Arrieta for a called third strike. Replays indicate the pitch was located off the outer edge of home plate and thigh-high (px -1.114, pz 2.514), the call was incorrect. Following the conclusion of the top of the 8th inning, Montero was ejected for arguing the previous half-inning's strike zone. Replays indicate that of the four callable pitches ruled a ball (excluding the four intentional balls), Cuzzi officiated all four correctly for 100% accuracy, the call was correct. At the time of the Bourn ejection, the Indians were leading, 3-0. At the time of Montero's ejection, the Indians were leading, 5-0. The Indians ultimately won the contest, 6-0. These are Phil Cuzzi (10)'s first and second ejections of 2015. Phil Cuzzi now has 1 points in the UEFL Standings (-1 Prev + 2*[2 MLB] - 4 Incorrect + 2 Correct = 1). Crew Chief Gerry Davis now has -1 points in Crew Division (-2 Previous + 0 Incorrect + 1 Correct = -1). These are the 91st and 92nd ejections of the 2015 MLB Regular Season. This is the 43-44th player ejection of 2015. 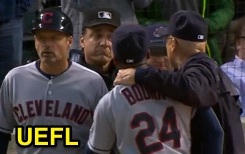 Prior to ejection, Bourn was 0-2 (2 SO); Montero 0-3. This is the Indians' 2nd ejection of 2015, T-3rd in the AL Central (KC 9; CWS 3; CLE, DET, MIN 2). This is the Cubs' 3rd ejection of 2015, T-2nd in the NL Central (CIN 4; CHC, MIL 3; PIT, STL 2). This is Michael Bourn's first ejection since June 19, 2011 (Jeff Nelson; QOC = Y [Balls/Strikes]). This is Miguel Montero's first career MLB ejection. This is Phil Cuzzi's first ejection since July 2, 2014 (Ron Roenicke; QOC = Y [Check Swing]).